I’ve been working on a new model based upon our conversation. I found a bunch of errors in my original model that I missed the first time. I fixed the graphs as well. One of them didn’t provide any meaningful information so I removed it. From this model I’ve developed FE latitudes which have nothing to do with GE values. The latitude values are a function of radius and the height of polaris – [FE Radius]*COS((FE Latitude)/180*3.14159) = FE Radius @ latitude. – Objects at a distance increase in height at an unequal rate as the object approaches assuming a constant velocity. – A viewing angle of 0-45 degrees is obscured from the bottom-up. – A viewing angle of 45-90 degrees is obscured from the top-down. – The obscured area subsequently obscures a proportional amount of viewing angle. I’ve highlighted sections that have interesting or important values. 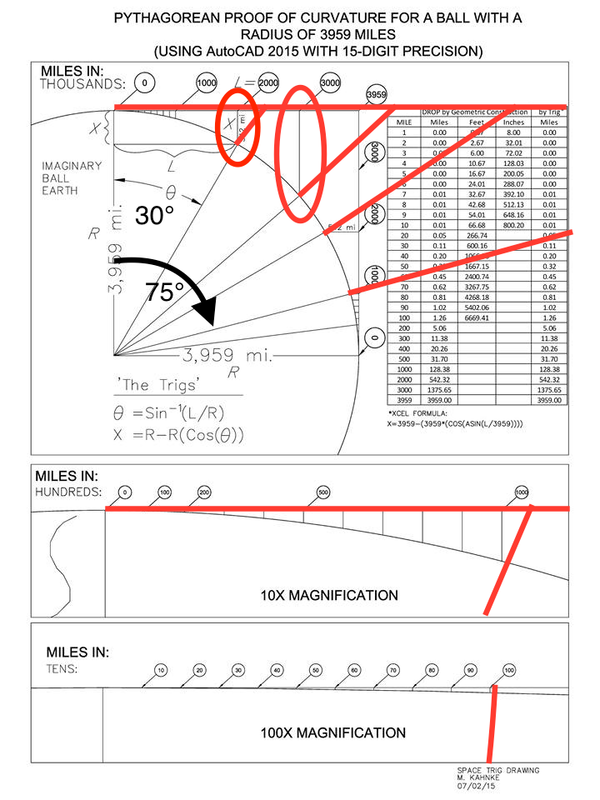 I have a hypothesis that the GE radius (3959 mi) was used since the distance to Polaris is 3959 miles. They just rotated the model 90 degrees. I’m added in some actual locations (Toronto, Vancouver, Quito, Monterey) and compared the model against real-world distances. It fits quite well. I think the Viewing Angle issue is resolved by the model since it shows how perspective obscures the top and bottom. Recently I’ve was in a rather colourful chat with a proponent of the globe model. It was actually quite useful as it forced me to fix a few errors on one of my previous posts. I’ve been working on a model for the flat plane using trigonometry and from that I developed a couple of axioms. Dealing with people who are both closed off to new ideas and have anti-social tendencies can make a rather potent brew of a personality. However, I see it as a way to strengthen the flat plane model rather than harming it. Just like you need the resistance of the ground beneath your feet to walk, we also need resistance from the globe proponents – without it, we couldn’t develop the models we have. With that in mind, I’ve been wanting to examine perspective in relation to Euclidian geometry. 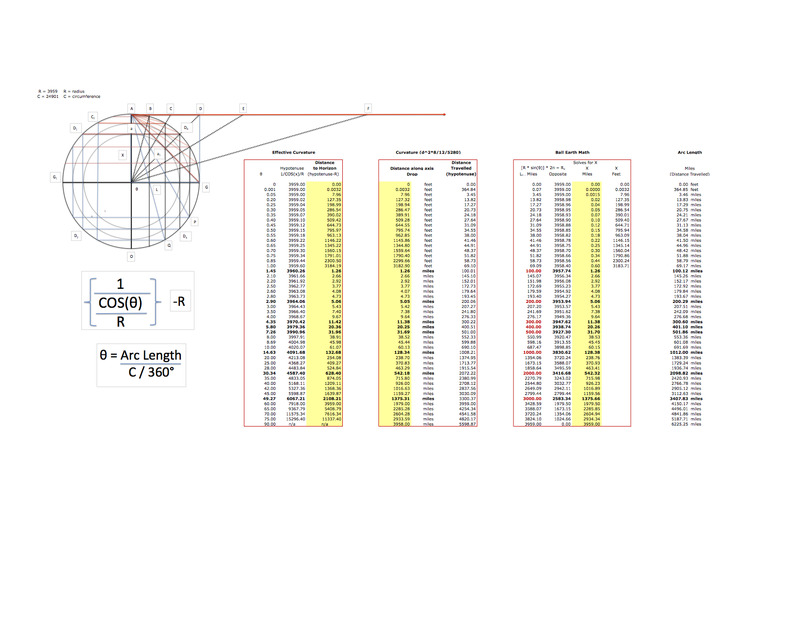 This particular globe proponent relies heavily on geometry to bash the heads of flat plane folks. The thing that dawned on me was the important difference between perspective (which works in 3 dimensions – x,y,z) and Euclidian geometry which operates in only 2 dimensions (x,y). Of course the Euclidian axioms have been extended and expanded to incorporate solid geometry in 3 dimensions but not his original “Elements”. Assuming you’ve watched this video, you can see what is meant by “bunching”. The opponents of this video argue that he is applying perspective incorrectly because he can’t show where “…train tracks cross”. Now I’m not exactly sure if they are just using hyperbole or not but the idea is that you can’t “bunch” parallel lines. This is obviously the case if you apply Euclidian geometry in 2 dimensions. Just apply Axiom 5 to any set of parallel lines and they are absolutely correct. On a 8 x 11.5 piece of paper and draw an isosceles triangle and hold it directly in front of you face. This image is presenting itself in 2 dimensions. Now, while sitting at a desk, place the piece of paper flat on the desk with the top of the triangle pointing away from you. The triangle is now presented in 3 dimensions and takes on the laws of perspective. If you push the paper away, you will notice that the top and bottom of the triangle begin to “bunch” together. Eventually, the top and bottom will merge together. The two sides of the triangle never have to cross or change angles or alter in anyway – the object stays the same but it appears to change. You can do the same thing with parallel lines. Draw two parallel lines on another sheet of paper and hold it up to your face. Just as predicted in Axiom 5, the lines will never cross. Again, if you push the paper away from you, the bottom and top of the lines will also begin to “bunch” together. This is the point of Brian’s video but is ignored by the opponents of it. Again, they are applying 2 dimensional logic (which is correct if it stays in 2 dimensions) to a 3 dimensional observation. As I was trying to explain in my previous post, viewing angles are not linear with distance and proceed by doubling (1,2,4,8,16,32,64) while the distance needed to travel to achieve that viewing angle is only half. For example, a mountain that is 2.5 miles high can be seen at a distance of 144 miles with a 1 degree viewing angle. You would need to travel half that distance (72 miles) to see it at 2 degrees. And again, half that distance again (36 miles) to see it at 4 degrees, etc. The artists who work in this field do everything in their power to mimic reality so they take into account real affects not the opinions of either global or flat earth communities. But you get my point (I hope) that bunching on the horizon is a real phenomenon that has been modeled and expressed mathematically. I’m looking at modeling this phenomenon in a real 3D rendering system. Hopefully it will provide some necessary information for those looking into our world and our place it it. I’ve been thinking about how light, perspective and other artistic concepts seem to be missing from all official models. It then dawned on me that most scientists are not artistically inclined and will therefore, not be able to represent a true picture of reality. The result is a bizarre and non-nonsensical representation of imaginary ideas that can never exist other than in the mind (or minds) of the inventor(s) – in other words: scientism. I thought this was an exceptional and intelligent request for scientific inquiry regardless of the outcome. Nicely done. How do we know if the world is spinning or stationary? Do current images from space or the material in text books prove the Earth is spinning? Only if you believe the source to be valid. If, however, you are a natural scientist you would want to verify the veracity of the statements by repeating the experiments. Using these two examples, let’s look at what is experienced when a person walks upon the earth. If the earth is spinning it is comparable to the conveyor belt example except that the earth’s axis acts as the central wheel that “belt” of the earth’s surface or ground moves around. It cannot be the train example since the floor of the train is not in motion. We can see that additional energy is provided by the moving ground whereas no additional energy is provided to the person who is beside the belt. We could then create an experiment where a person would leap against the direction of the belt (both on the belt and off). We could place an object 5 feet from the person both on and off the belt and ask them to leap towards the object. Since the additional energy of the belt is continually compelling the object forward, we would theorize that the total distance between the person and the object would be less than then person leaping beside the moving belt. We could increase the acceleration and distance by using something like a canon. If we use the same arc and acceleration the ball should land at a greater distance from the canon if on a moving belt than if stationary. If we assume that the acceleration of the canon is 10/m/s/s, the tennis ball can reach 80 m/s velocity and has a total airtime of 10 seconds, we can calculate the total distance travelled (640m). If the velocity of the belt is 1 m/s then within 1 second the momentum of the belt has been overcome and we can add an additional 9 seconds of belt movement to the distance for a total of 649m. If we then turn around and fire the canon in the opposite direction then the distance travelled by the canon is subtracted from the total distance of the ball (1m/s x 10 seconds = 10m). This would mean that the total distance between the canon and the ball would be 630m. If we take the above example and apply it to a spinning earth then a similar result must take place. Taking the spin as the same as the conveyor belt one need only launch an object (a tennis ball thrower would suffice) to the west and then to the east. If the objects land at similar distances from the thrower then we are not spinning. However, if they land at different distances then we must be spinning.